Energy costs for businesses or home owners. Carbon footprint and the environmental impact of the filmed building. Buildings and homes with east, west, and south sun exposures can see a 10-15% energy savings in the summer and a 2-5% savings in the winter. 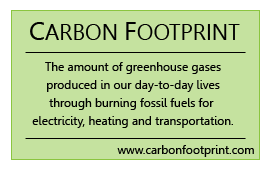 Use this Carbon Footprint Calculator to measure your impact on the environment. Then, schedule your complementary consultation with a SunGlo window expert to see how you can use solar film to reduce your Carbon Footprint.